Claybourne, A. and CLAYBOURNE, A. (2012). Harpies. In Gods, goddesses, and mythology. [Online]. Tarrytown: Marshall Cavendish Reference. Available from: https://search.credoreference.com/content/topic/harpies_greek_mythology [Accessed 25 April 2019]. Claybourne, Anna, and ANNA CLAYBOURNE. "Harpies." Gods, Goddesses, and Mythology, Marshall Cavendish Reference, 1st edition, 2012. Credo Reference, https://search.credoreference.com/content/topic/harpies_greek_mythology. Accessed 25 Apr. 2019.
in Greek mythology, winged women with sharp claws who snatched food, objects, or people. In Greek myth, the Harpies (meaning "snatchers") were female monsters who caused mischief, tormented wrongdoers, and carried souls to the underworld. They were known for their hideous appearance and smell. In the earliest accounts, the Harpies were not monstrous—they were simply spirits who represented windy or stormy weather, and they were depicted as beautiful young women with wings. Over time, however, they developed into terrifying beasts. They had long, fair hair and the faces and upper bodies of women, but the wings, tails, legs, and claws of birds of prey, with sharp talons made of metal. They were always ravenously hungry, and would steal food or even eat their victims before carrying away their souls. The Harpies were repulsive to look at, and they spread filth everywhere they went. They stank so much that whatever they touched gave off a terrible smell. There are several different stories of how many Harpies there were and where they came from. According to the eighth-century-BCE Greek poet Hesiod, they were the daughters of Thaumas, who was a son of Gaia, the earth goddess. In Hesiod's account, the Harpies were the sisters of Iris, the personification of the rainbow and a messenger of the gods. Other sources mention that they were the daughters of Typhon, another of Gaia's sons, and Echidna, a monster who was half woman and half snake. Some stories say there were countless Harpies; in others there were between one and four of them. At least four of the Harpies had names: Celaeno, Aello, Ocypete, and Podarge. Podarge, one of the Harpies, was the mother of Xanthus and Balius, the two magical horses that ran like the wind and pulled the chariot of the Greek hero Achilles during the Trojan War. The horses' father was Zephyrus, the West Wind. The gods gave Xanthus and Balius to the hero Peleus as a present on his marriage to the sea goddess Thetis—the horses then passed to the couple's son, Achilles, when he went to Troy. Soon after the horses were born, Hera, the wife of Zeus, gave Xanthus the power of speech, and during the Trojan War he spoke to Achilles. He warned him that although he would survive a forthcoming battle, he would die soon afterward. The Furies, the spirits of vengeance, struck Xanthus dumb to punish him for what he had told Achilles. When Patroclus, Achilles' best friend, was killed at Troy, both Xanthus and Balius wept, and Zeus was sorry that he had allowed them to get involved in the fighting and violence of humans. The Harpies could be sent by the gods—especially Zeus, Hera, and Athena—to punish people, and they were sometimes referred to as "the hounds of Zeus," but they could also cause problems on their own by stealing, destroying property, causing storms, and kidnapping people. The most famous myth involving the Harpies is the tale of King Phineus. He was a king of Thrace, in northern Greece, who offended the gods. There are various accounts about what he did wrong, but in the best-known version he remarried after his wife died, and, in his desperation to please his new bride, allowed her to torture his children, who ended up being blinded. In another version Phineus was granted the gift of prophecy, but foretold the future so well that he infuriated the gods by revealing their plans. As punishment, Phineus was himself blinded, and the gods also sent the Harpies to make his life a misery. The monsters constantly snatched his food from his hands or spoiled it with their foul stench, so Phineus could never get enough to eat and grew painfully thin. He was finally rescued when Jason and the Argonauts came past Thrace on their journey to fetch the Golden Fleece. Two of the Argonauts, Calais and Zetes, the brothers of Phineus's first wife, decided to help the king, and drove the Harpies away to the Strophades Islands. They were going to kill them, but the Harpies' sister, Iris, persuaded the Argonauts to spare them if they promised to keep away from Phineus. In some versions the Harpies then went to Crete; in others they stayed in the Strophades. 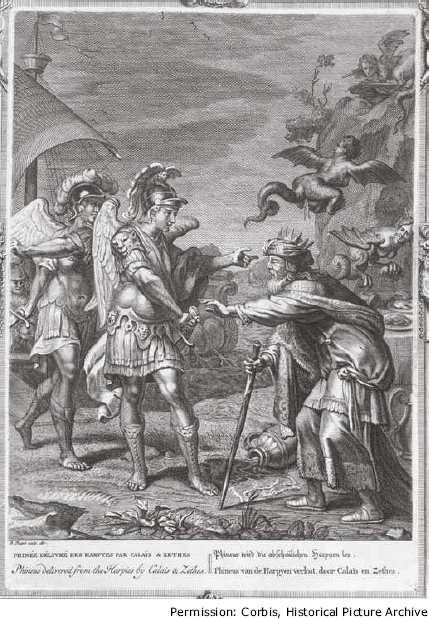 The Argonauts Calais and Zetes rescue Phineus from the Harpies in this engraving by French artist Bernard Picart (1673–1733). The overturned amphora indicates the damage caused by the monsters. The Harpies also played a role in the story of Aeneas, survivor of the Trojan War and the son of Aphrodite, goddess of love. After Troy was destroyed, Aeneas wandered far and wide until, following a prophecy that he would establish a great city, he went to Italy and founded Rome. During his journey, Aeneas sailed to the Strophades Islands, where the Harpies were living. He and his men slaughtered some wild goats and cattle for food. They made offerings to the gods before eating, but as they sat on the beach to enjoy their feast, the Harpies swooped down, snatched their food, and spread stinking filth and dirt all around. The sailors moved to another spot, but the Harpies found them and ruined their food again. Aeneas ordered his men to fight, but their blades could not harm the monsters. Celaeno, the leader of the Harpies, told the sailors that, although they would end up in Italy, they would suffer terrible hunger as a punishment for trying to kill her and her sisters, and would not be able to found a city until they were so hungry that they had eaten their tables. In Italy, after landing at the mouth of the Tiber River, Aeneas and his men were so hungry that they ate the round bread platters on which they had been served a meal. They realized that these were the "tables" to which Celaeno had referred. According to Roman poet Virgil (70-19 BCE), who recounted Aeneas's travels in the Aeneid, in her speech to Aeneas and his men, Celaeno refers to herself as "the eldest of the Furies." The Furies (or Erinyes) were the female spirits of justice and vengeance who punished wrongdoers, often by driving them insane. The myth of Pandareos also links the Harpies to the Furies. Pandareos was a man from Crete who upset Zeus by stealing his golden dog and giving it to Tantalus, one of Zeus's sons by the Titaness Pluto. Zeus turned Pandareos into stone as a punishment. His daughters, Clytia and Cameira, were cared for by Aphrodite, who fed them milk and honey and found husbands for them, but just as the two young women were about to be married, the Harpies took them away to be slaves to the Furies. The Harpies' connections with the Furies, as well as their actions in other myths, suggest that people believed that they were able to carry away the souls of the dead. Female spirits or superhuman beings who had this power are found in stories from many ancient cultures. In Norse myth, the Valkyries took dead warriors into Valhalla, where they lived in a great hall alongside the chief god Odin. Like the Harpies, the Valkyries could be either beautiful or terrifying. In Egyptian myth, the goddess Taweret carried the dead into the next world, while the Celts believed that this role was performed by Morrigan, a raven-goddess who ate the flesh of dead people and carried away their souls. To the ancient Greeks, the Harpies represented the punishment that came from displeasing the gods, but they were also associated with unfairness and random bad luck. Like the winds that they originally embodied, the Harpies could come out of nowhere, ruin plans, and destroy people's lives. People blamed them for storms and for any small objects or items of food that mysteriously went missing. In modern times, the word harpy is sometimes used to mean a mean, heartless woman. However, some people also see the Harpies as a symbol of feminism, because they were strong female characters who represented male fears about female power. The Harpies' names reflect the fact that they were originally storm spirits: Celaeno means "storm cloud," Aello means "rainstorm," Ocypete means "swift flier," and Podarge means "swift-foot." Although they developed into monstrous creatures, they continued to be associated with weather and were blamed for strong winds and storms. Many gods, spirits, and monsters in mythologies from around the world are associated with different kinds of weather. In Greek mythology, for example, the Harpies' sister Iris was the goddess of the rainbow, and the god Aeolus controlled the winds. In Australian Aboriginal mythology, the Rainbow Serpent, one of the most powerful of all deities, controlled storms, rain, and floods. Many cultures have a god of rain, such as En-kai or Ngai, the rain god of the African Masai people. Since weather comes from the sky, it makes sense that people throughout history have interpreted rain, thunder, rainbows, and other forms of weather as signs, punishments, or rewards from the gods, who were usually thought to live above Earth. 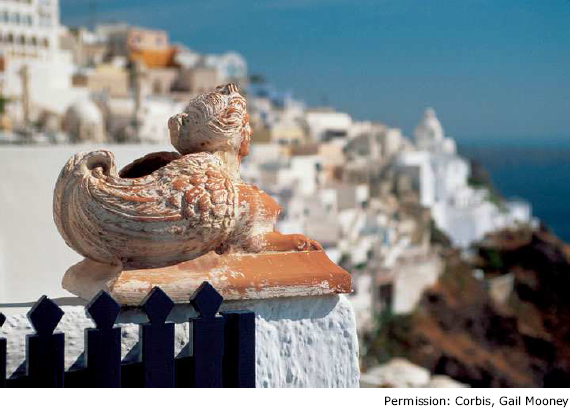 A terra-cotta Harpy overlooking the Aegean Sea on the Greek island of Thera. The Harpies were first known as weather spirits, and the Greeks often blamed them for causing storms. A number of ancient authors gave accounts of the Harpies, including the Greeks Hesiod, Apollonius of Rhodes (third century BCE), and Apollodorus (second century BCE) and the Roman Virgil. In the Odyssey, Homer (ninth–eighth century BCE) describes the Harpies as wind spirits. Many artists have depicted the Harpies. They appear in pictures on ancient Greek vases and temple carvings, and they have inspired more recent works, including paintings by French illustrator Gustav Doré (1832–1883) and British Pre-Raphaelite painter Evelyn de Morgan (c. 1850–1919). See also: ACHILLES; AENEAS; CRETE; DEATH AND THE AFTERLIFE; FURIES; GAIA; JASON; NATURAL FORCES; TANTALUS; VALKYRIES; ZEUS. Apollonius Rhodius, and R. Hunter, trans. Jason and the Golden Fleece. New York: Oxford University Press, 2009. Rose, Carol. Giants, Monsters, and Dragons. New York: Norton, 2000.